Every wedding and quinceañera has its own style, every bride has her favorite color, and every album can be tailor-made to fit. Mix and match the cover materials, color, and page thickness to your delight. Each album is a unique, hand-crafted labor of love that will remind you of the emotions and beauty of your wedding for generations to come. Linen is a light, textured, animal-friendly option for covering your albums that highlights the true hand-made, artisan nature of our books. The layered weaves are a delight to the fingers, while the colors are a feast for the eyes. 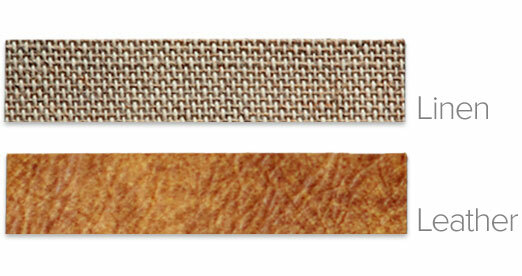 We use only 100% natural leathers selected for their grains, texture, strength, durability, and quality. We have a line of distressed leathers, which enchant with their rugged, natural beauty; and a line of rich, simple colors that are sure to impress. No matter which line you choose, your cover will be soft to the touch with the smell of luxury. Your choice of two page thicknesses. The thick pages are more rigid than the thin ones allowing you enjoy a full spread up to 12x24" big in the 12x12" book. The thin pages are great for the smaller 6x6" book that you can rave about while showing a mini-copy of your album that’s always tucked in your purse. 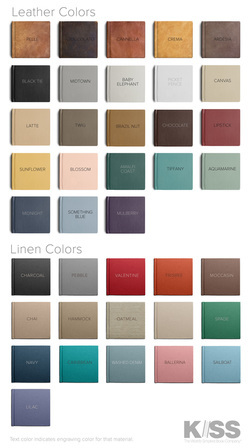 Click on the color swatch above to see all the beautiful available colors. 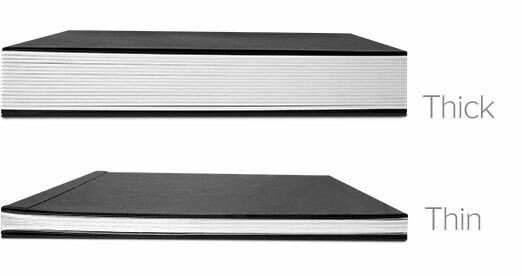 All flush-mount albums are square and custom designed in 6", 8", 10", 12" and 14".